What is wrong is wrong, no matter who said it or where it's written. To turn on English subtitles, click the CC in the Vimeo player. 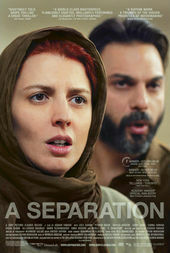 The characters in Asghar Farhadi’s 2011 film A Separation are trapped under protocol. In an interval wedged between a responsibility to the past and a duty to the future, their lives whirl in a conflicted present. The film is a raw and sensitive telling of a situation in which there is no right and no wrong, but a multitude of searing greys. Its title sequence and opening scene feature a cold, repetitive scan of identification documents and then an address, the characters explaining their situation directly into the camera. The viewer is first asked to look at these people as they exist on paper, and then into their eyes, to understand and to decide. One of the most captivating films of 2011 begins with this question and it takes a village to make a child answer it. Our thanks to Rei Marzoughi for her aid in translation.